More than a year and two amendments later, the much-debated National Counter Terrorism Centre (NCTC) today faced the same Opposition from states as it did last year, raising questions within the security establishment on whether terrorism can be countered without a cohesive pan-India anti-terror body and a policy. 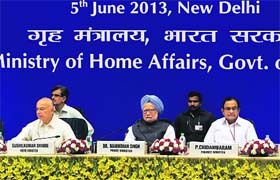 PM Manmohan Singh, Finance Minister P Chidambaram and Home Minister Sushilkumar Shinde attend the Conference on Internal Security in New Delhi on Wednesday. Union Home Minister Sushilkumar Shinde on Wednesday warned of attempts by Pakistan�s ISI to revive militancy in Punjab and other parts of the country. This is the second time in nine months that the Centre has cautioned against revival of terrorism in Punjab. PML-N chief Nawaz Sharif on Wednesday scripted history on being elected to an unprecedented third term as Pakistan�s Prime Minister. 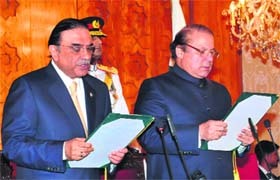 President Asif Ali Zardari administered oath of office to Nawaz in a glittering ceremony at the Presidency. Pakistan President Asif Ali Zardari (left) administers oath to Prime Minister Nawaz Sharif at the Presidential Palace in Islamabad on Wednesday. The Congress today suffered a setback in the byelections to four Lok Sabha seats across the States of Bihar, Gujarat and West Bengal as it failed to win even a single seat. It also faced the ignominy of conceding all six (two Lok Sabha and four Assembly) seats to the BJP in Gujarat. 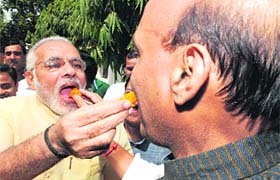 BJP president Rajnath Singh & Gujarat CM Narendra Modi celebrate the party�s success. SPORTS: Is this man in Control? Defence Minister AK Antony, who is on a visit to Australia, met his Australian counterpart Stephen Smith over two days to discuss shared strategic and security interests, including maritime security and bilateral defence cooperation. Almost half of the students who took the Class X examination of the Board of School Education, Haryana, (HBSE) have failed. The result was announced today. It would be available on the website of the board from 9 am tomorrow. In all, 50.79 per cent candidates have cleared the examination conducted by the board in March this year. Girls outshone boys in this examination, too. An Indian eye care institution is celebrating its one millionth free eye surgery with a special ceremony on Thursday at the Churchill Dining room in the House of Commons. NRI Punjabi MP Virendra Sharma, who represents the Ealing Southall constituency in UK Parliament, has agreed to preside over the occasion.